Lymphocytic choriomeningitis virus (LCMV) primarily infects wild mice. It is estimated that 5% of wild mice across the US carry LCMV. Mice can carry and shed the virus for their whole life without becoming ill. Hamsters, people, and a few other animals can also be infected. In discussions of lymphocytic choriomeningitis, you may see two abbreviations: LCM and LCMV. LCM refers to the disease (lymphocytic choriomeningitis) and LCMV to the virus itself (lymphocytic choriomeningitis virus). LCMV is shed in the saliva, urine, and feces of infected mice. People and other animals become infected through contact with these secretions or by inhalation of dried particles from them. An infected hamster may not show signs of illness but may shed the virus, transmitting it to people. The virus is not thought to be contagious from person to person, except that pregnant women can transmit the virus to their fetus, which can have serious consequences. What Rodents Carry the Disease? Mice and hamsters seem to be the main carriers. Guinea pigs have uncommonly been infected. Mice and hamsters can become infected at a pet store by contact with other infected rodents, or from contact with wild mouse urine or feces. Infection with LCMV doesn't necessarily cause symptoms, but for most people who do become ill, symptoms develop within 1 to 2 weeks of exposure to the virus. Symptoms most often include fever, fatigue, lack of appetite, muscle aches, headache, nausea, and vomiting. These can last for up to a week and may be followed by a short recovery, then fever, neck pain, headache, confusion, and other symptoms of inflammation in the brain occurs. For most healthy people, the disease is quite mild and recovery complete. If the inflammation in the brain is severe, longer-lasting effects can be seen. However, there are two groups of people for which infection with lymphocytic choriomeningitis virus is a very serious concern: immunosuppressed individuals and pregnant women. Pregnant women who become infected can pass the virus onto their fetus. This can result in miscarriage or birth defects including long-term neurological (brain) problems in the baby. Pregnant women would be best off avoiding contact with pet rodents, to be on the safe side. People who have suppressed immune systems for any reason, including chemotherapy treatment, treatment with immunosuppressive drugs (e.g. for autoimmune diseases, transplant patients), and HIV infection are at much greater risk for serious illness from LCMV. If you fall into this category and become ill, inform your doctor of any contact with rodents. Good hygiene helps prevent transmission from pets. This includes diligent hand washing after handling pet rodents or their cages, bedding, dishes, and toys. Supervise children to make sure they do the same. Pet rodents should be kept out of the kitchen and away from food, and should not be held near faces or mouths (no kissing!). Clean cages away from the kitchen sink or food preparation areas, and disinfect the sink or tub that is used for cage cleaning with a bleach solution. Infestations with wild mice pose a risk of transmission of LCMV to humans as well as pets. Block access to your home and other buildings to mice, keep all food sources inaccessible to wild mice, and use traps. For severe infestations, get a pest control company involved. If you need to clean mouse droppings, soak them with a bleach solution (1/4 c bleach in 1 gallon of water) first and then wipe them up rather than sweeping or vacuuming, to prevent the virus from becoming airborne. The risks of contracting LCM from a pet hamster or any other rodent is very low. In most households, normal hygiene and careful handling are all that is necessary to prevent problems (and careful hygiene should always be followed regardless). 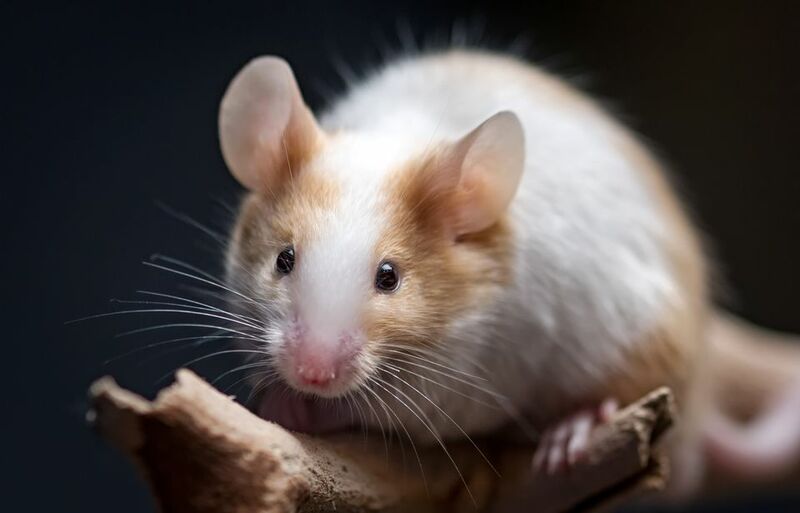 You may need to supervise your children to make sure they are handling pet rodents including hamsters and mice safely to prevent infection, as mentioned above. However, pregnant women may want to avoid contact with pet rodents at all because the outcome of infection during pregnancy can be so serious. Similarly, immunosuppressed people may want to avoid pet rodents including hamsters and mice. Interestingly, estimates say that 2 to 5% of the US population has antibodies that indicate exposure to LCMV. In most cases, people become infected without even realizing it (even if they become ill, the symptoms are often described as flu-like so no exact diagnosis of LCM is made).